AMONGST THE MANY FALSE TRUTHS THAT EXIST ABOUT WOMEN, US NOT LIKING WHISK(E)Y, IRISH, SCOTTISH, AMERICAN, CANADIAN, JAPANESE OR OTHER, IS AS SUCH, PROPAGANDA. AN URBAN MYTH NO DOUBT CONJURED UP BY MEN, SO THEY CAN HAVE MORE FOR THEMSELVES. 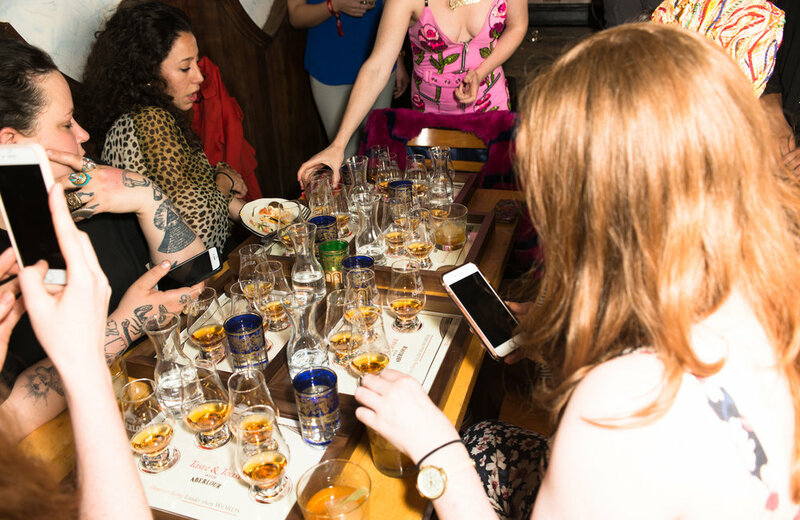 When the opportunity for an evening of sampling Speyside's finest scotch in the company of New York's finest females, was presented to a select group of fabulous women, nobody responded with 'Sorry, I don't like whisk(e)y', for the record. And so, last week I was honored to host and toast some of New York's most talented creative women at the newly opened 'The Blue Quarter' in the East Village, with Aberlour Whisky. When I was first approached by Aberlour (pronounced AAH-BURR-LOWER (OW as in 'OW YOU HURT ME!)) about hosting a Taste and Toast event, my initial reaction was 'but you're not an IRISH whiskey and I've pledged my allegiance to the Midleton Distillery' (#REDBREAST4LIFE). But they weren't perturbed. They knew what they were doing. The Aberlour team's pitch to me was that they had identified a select number of people in New York who were committed to living lives of purpose and action, whose values aligned with those of their brand and their founder, James Fleming. Those who stand for something positive and inclusive. Those who instill and cultivate a sense of community through their work. Understandably and flattery aside, I was sold. I mean, it also helped that I'm a huge whiskey fan but really, it's about the alignment of our values. Really. I feel I owe the discovery of my life purpose to the time I've spent living in New York (mostly because in my previous life, I was too busy being a slave to the Mac in AdLand to think about, let alone figure out what this might be). Those I've met who've helped mold and shape my New York experience, those I've talked to at length about my frustrations with the world, the portrayal of women in fashion and beauty industries and the profound lack of fun in the imagery being published (one must appear miserable to be in 'FASHION') - the output of which has manifested itself as The Scarlet Bob, a platform to openly discuss and poke fun at it all. The event was graced by a mix of entrepreneurs, artists, designers, illustrators, photographers, animators, stylists, journalists, mixologists and creative directors. Some of whom were insta-life-meets-real-life first dates in that we 'knew' one another from the gram, but had never met in person before the event! We were treated to flowing amounts of a signature old fashioned style cocktail made with Aberlour 12 year old that was chilled the best tasting ice cube, possibly of all time - frozen coconut water and Earl Grey tea - and garnished with paprika. Yep, things got real fancy. 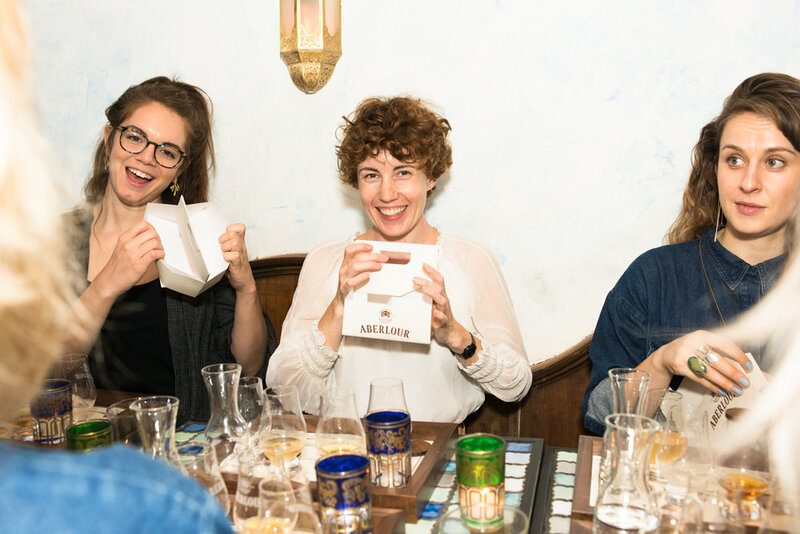 We were led through a tasting of Aberlour 12, 16 and 18 and Aberlour's Cask Strength expression, A'Bunadh, by 'Other Gemma' who works as their brand ambassador in New York. Creative collaborations were planned. Friendships were forged. Much whisky was consumed and a jolly old time was had by all. Especially after we got the A'Bunadh down our necks which was the finisher of the evening at a cool 59.65% proof. All in a day's work for the creative woman of New York. After lengthy goodbyes and the exchange of instagram handles (because seemingly. that's what matters these days), we all went on our way, responsibly buzzed :-) Thanks Aberlour for a tremendous evening. Sláinte! Midleton Distillery: The oldest and best whiskey distillery in Ireland, located at Midleton, Co. Cork. The place from where my favorite Irish whiskeys come - Green Spot, the Redbreast family and Powers Signature Release. Redbreast: My favorite Irish Whiskey. Complete coincidence that it happens to have 'red' in its name. Not to be confused with Red Bush that is also an Irish whiskey that's aside from its hysterical name, is not a patch on Redbreast. Breast or Bush? You decide. Whisk(e)y: As someone who's highly critical of spelling and grammar, I strive to be as accurate as possible when writing anything. Whisk(e)y is me referring to the spirit worldwide, encompassing all the countries that are making it. It's spelled either 'whisky' or 'whiskey' depending on where it originates. Whiskey: Refers to the spirit that is distilled in Ireland and America (although there are some exceptions in the US where it's spelled 'whisky'). Plural is 'whiskeys'. Whisky: Refers to the spirit that is distilled in Scotland, Canada and Japan. Plural is 'whiskies'. Mold: American English for 'mould'. As in to shape something. Also means 'mildew', in American English. In Irish English we call that 'mould' too. Pat Sherlock: My Dad. Most commonly known as Pat or Pato. The 'Pat' half of 'Pat and Veronica' who are both my parents. Pat's most detested word is 'awesome' as he believes that it is outrageously overused by Americans and to add insult to injury, completely out of context. I tried to explain to him that it's kind of like the Irish equivalent of 'grand', in that it's a universal response for almost everything that happens in life and doesn't actually mean what 'awesome' is defined as in the dictionary and the Americans could probably accuse us of the same offense. But he wasn't having any of it. So it's just as well I've followed up with a swift apology to him. I don't think he reads any of my writing anyway, although out of all I've published this is probably the piece that makes the most sense. Other Gemma: The only 'Irish Gemma' in New York until I came along. Apparently. She became 'other Gemma' to me and for a time, despite the fact that we look nothing alike, there was much confusion between us. Who'd've thought there'd ever be TWO Irish Gemmas living in New York at the SAME TIME?! Our only hope is that a third one doesn't land over or else there'll be fierce bewilderment altogether. Sláinte: Gaelic (Irish language Irish (as opposed to Irish English) and Scottish) for 'cheers'. Meaning 'good health' by way of direct translation. And is used when making a toast, most commonly when alcohol is involved! We respect your privacy, but Gemma needs your attention and eventually your money.